Esta ponencia se enfocará en la enseñanza de los apóstoles Pablo y Juan con respecto al nuevo nacimiento en Cristo. ¿Qué significa nacer de nuevo en Él y ser una nueva creación en Cristo? ¿Cómo puede esto ser realizado en conformidad con Cristo como la fuente y cabeza de la nueva creación? This lecture will focus on the teaching of the apostles Paul and John regarding the new birth in Christ. What does it mean to be born again in Him and to be a new creation in Christ? How can this be realized in conformity to Christ as the source and head of the new creation? 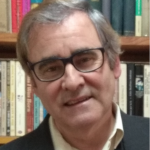 Alfonso Ropero Berzosa is a Professor, Spanish Author & Historian, and Editorial Director of CLIE (Spanish publisher now under HarperCollins Christian Publishing) in Ciudad Real, Spain. To learn more about Alfonso Ropero Berzosa, click HERE.